Speed Systems' Ratcheting Quad Box Wrenches are designed to provide end to end isolation for maximum safety. 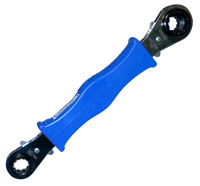 The RBW wrenches have an ergonomically designed handle with a center "window" displaying the separation of the tool ends. Contact the factory for styles and configurations not shown.